Can (9.7"/12.9") iPad Pro play Blu-ray? Recently, Apple has announced its new generation of iPad Pro - new 9.7-inch iPad Pro with the same Retina display as 2015 12.9-inch iPad Pro has. Such a amazing screen portable device makes watching any kinds of video: from HD movies and TV shows to podcasts and music videos easier. On this occasion, it is believed that watching Blu-ray movies on iPad Pro 9.7/12.9-inch Retina Display will be a great enjoyment to you. This page will share you the easy solution to guarantee Blu-ray playback on iPad Pro successfully. Stay on. Say you're on an airplane, subway home or right lie in living room bed, pull out your iPad Pro, and fill your leisure time with Blu-ray movies. You can watch up to 10 hours of Blu-ray on iPad, so even the longest flight will fly over. Or think about it in another case: If you miss the films for theatrical release, when these films come out on Blu-ray, watching Blu-ray movies on Apple iPad Pro (9.7"/12.9") time after time is more comfortable, even. 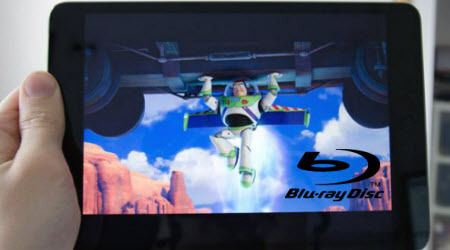 However, you sholud know any tablet is not big enough to hold any Blu-ray disc. And that's a problem for all of us. Besides, only a video fully compatible with iPad Pro like H.264, MPEG-4 and Motion JPEG videos in formats .m4v, .mp4, .mov and .avi can be played on this Apple device without hassle. It means that Blu-ray cannot be watched on iPad Pro directly unless digitizing Blu-ray to iPad Pro acceptable formats. Then which is the Blu-ray to iPad Pro Ripper must be your first concern. iFastime Video Converter Ultimate support fully remove any protected Blu-ray with MKB, including MKB V1 to MKB V58 so that you can rip all Blu-ray region A B C to iPad Pro, iPad Mini (4/3/2), iPad Air (2), iPhone, iPod, Apple TV. It ensures ripping and backup Blu-ray to iPad Pro with remarkable high video/audio quality. Also, you can fully adjust parameters to control iPad Pro video quality and file size. Only $36.76 is needed at Facebook! It generated a video file that imported to iTunes and then synced to an iPad with ease. Further, the exported file had no imperfections in the audio or video. It was indistinguishable from the original Blu-ray disc or the same content downloaded from the iTunes Store. It has easy-to-use customization tools that allow you to perform basic edits easily. The manufacturer has a long history of making high-quality, easy-to-use disc ripping, copying, and conversion software. And it creates a very good though not perfect video file. This Blu-ray converter is fairly straightforward to use; It comes with a library of preprogrammed profiles not only for the iPad but also a healthy list of other devices like the iPhone, Nintendo DS and even some Android devices. However, program is outdated and doesn't include the latest generations of the iPad or any other device on its list. What makes this application different than the other programs is that it can optimize your conversion for nine different iPad models. No matter what application you use, converting Blu-ray discs for playback on an iPad is a time consuming process. 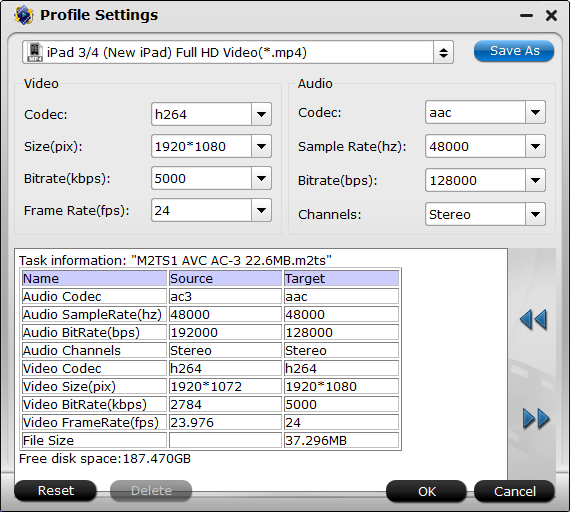 Generally, Tipard Blu-ray to iPad Ripper takes about an hour-and-half to convert one hour of Blu-ray footage. That may sound like a lot. One thing that really holds this program down is the fact that it does not bypass the copy encryptions found on almost all commercial discs. As the saying goes, "Actions speak louder than words". Follow the use guide and you can find the easiest way to rip Blu-ray to play on iPad Pro 9.7/12.9-inch Retina Display. 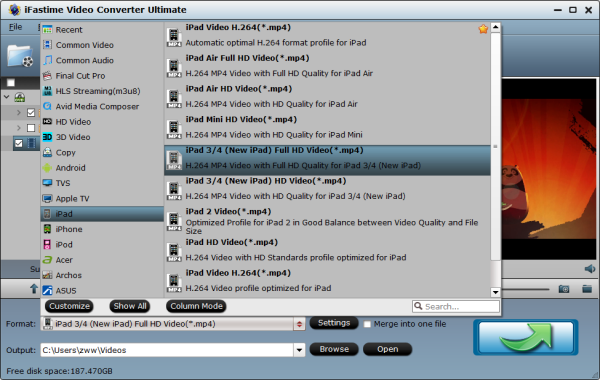 Take iFastime Video Converter Ultimate as an emaple here. All you need to do is to select a Blu-ray, set iPad Pro profile and start ripping Blu-ray. Then you can watch any Blu-ray content you want on iPad Pro with ultra high definition effect. Install and run Blu-ray Ripper for iPad Pro to Your PC. After you insert a Blu-ray disc into the computer Blu-ray drive, back to the software interface and click "Load file(s)" button. Then it flashes right to you preloading the Blu-ray content. And you'll notice that among the several titles there's a title ticked off. It is the main movie. You wouldn't have to consider other titles. Tip: If you want to watch Blu-ray on iPad Pro with desired subtitle, you can click the drop down menu after "Subtitles" to select your desired one. Click "Format" and Select an Output Profile for iPad Pro. Here you can select "iPad > "iPad 3/4 (New iPad) Full HD Video(*.mp4)" as output format. The output videos will reserve maximum quality. Optimization settings - The default settings may not satisfy you, you can click the Settings button to change the setting by the yourself.Keep, please note the size and quality of the file to convert more than a resolution based on the bit rate (bit rate in the relatively large files the results of high dimension, and reduce the loss of visual quality, and vice versa). In addition to Blu-ray, iFastime Video Converter Ultimate also allows you to rip DVD and convert videos like MP4 or MKV to any types of iPad, as well as Android, iPhone and iPod devices safely and effectively.You can choose to customize your videos as you like. The built-in editor will make your videos more wonderful. More info: iPad Pro 9.7 vs iPad Pro 12.9-What's the difference? The Apple iPad Pro 12.9-inch measures 305.7 x 220.6 x 6.9mm and weighs 713g for the Wi-Fi only model or 723g for the Wi-Fi and Cellular model. It offers the same aluminium design as the iPad Air 2 with the Lightning connector centralised at the bottom and Touch ID built into the home button on the front. The Apple iPad Pro 9.7-inch measures 240 x 169.5 x 6.1mm and weighs 437g. This is of course significantly smaller than the 12.9-inch iPad Pro, as well as slightly slimmer, but the design is the same, just on a smaller scale. The 9.7-inch iPad Pro comes with the four built-in speakers like the Pro, as well as the Smart Connector. Touch ID is also on board but it will come in rose gold, as well as the same gold, silver and space grey colours of the larger iPad Pro. The Apple iPad Pro is the largest iPad available in the company's line up, with a 12.9-inch display. The LED-backlit Retina display has a 2732 x 2048 resolution for a pixel density of 264ppi. The smaller iPad Pro features a 9.7-inch display with a 2048 x 1536 pixel resolution, which results in the same pixel density as the 12.9-inch model at 264ppi. The new model has what Apple is calling a True Tone display however, as well as a wide colour display, which should mean a slightly improved display experience to the larger model. The larger iPad Pro's display can measure pressure, allowing it to work with the Apple Pencil and the smaller iPad Pro will offer the same technology. This will enable users to draw and design as they would on the 12.9-inch iPad Pro but on a smaller, more portable device. The Apple iPad Pro 9.7-inch not only adds a True Tone flash to the mix, making it the first iPad to offer this feature, but it also bumps up the resolution. The new 9.7-inch iPad offers a 12-megapixel snapper with a f/2.2 aperture and 4K video recording capabilities, as well as a 5-megapixel front facing camera with Retina Flash. It's basally the iPhone 6S but in tablet format. This means the iPad Pro 9.7-inch is the most capable Apple tablet available in terms of camera and there should be a nice improvement over the larger iPad Pro. The Apple iPad Pro 12.9-inch comes with the A9X processor and M9 motion co-processor. It also sports 4GB of RAM and a 38.5 watt battery. The Wi-Fi only model comes in 32GB and 128GB options, while the Wi-Fi and Cellular model is only available with 128GB of internal storage. The Apple iPad Pro 9.7-inch comes with the same A9X chip as the iPad Pro. Both 3GB and 4GB of RAM were thrown about in speculation but Apple has yet to detail specifics on RAM or battery so we will update when we find out. In terms of storage however, the iPad Pro 9.7-inch comes in 32GB, 128GB and 256GB options, for both the Wi-Fi and Cellular models. The Apple iPad Pro 12.9-inch comes with iOS 9, offering all the features you'd expect including Apple Pay support, AirDrop, AirPlay, Spotlight Search, Apple Music and Family Sharing among others as standard. It also comes complete with Pages, Numbers and Keynote, offering users the company's productivity apps. The Apple iPad Pro 9.7-inch also comes with iOS 9 so expect the same software experience as the larger Pro. Based on the specs, it is easy to see why the new 9.7-inch iPad has fallen into the Pro range rather than the Air. It not only comes with the same design as the larger iPad Pro, but it brings in the same performance power too. The iPad Pro 9.7-inch is for those who like the idea of the iPad Pro and all the features it offers, but want it in a smaller and cheaper format, with better camera capabilities. Will iPad (Air 2/Mini 4/Pro) support playing 4K content?